The G-Line train from Denver Union Station to Arvada and Wheat Ridge will finally open April 26 after more than two years of delays. The Regional Transportation District initially said the line would open in 2016. The agency also set a more recent opening date, for March 31, which passed yesterday. After so many broken promises, the agency emphasized that the announcement today was not an April Fool’s joke. Like the University of Colorado A-Line, the G-Line uses a new positive train control system. Glitches in the system triggered crossing arms at imprecise times, which failed to meet federal safety standards. 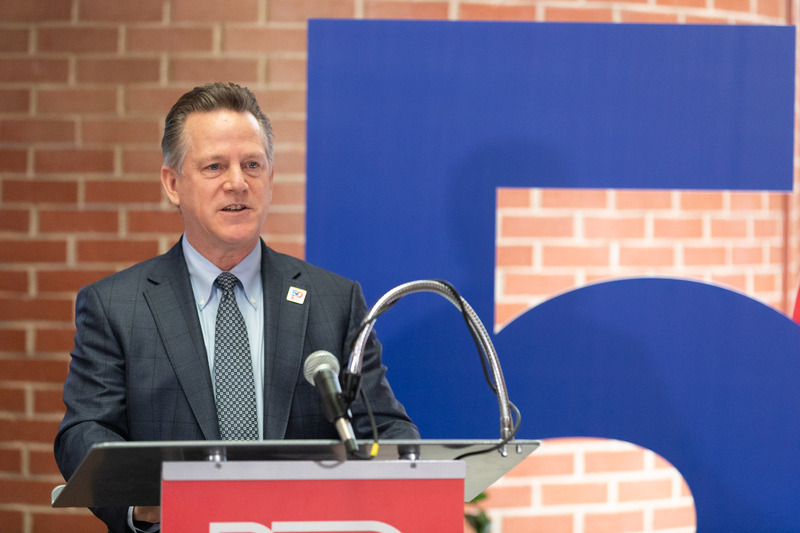 But federal approvals finally arrived late last week, said RTD’s General Manager and CEO Dave Genova at a press conference held this morning at the agency’s downtown Denver headquarters. He also thanked the public for enduring the wait. To celebrate the line’s grand opening, RTD will offer free rides on the 11.2-mile commuter line Friday, April, 26. On Saturday, there will be free service across the entire rail system, with parties at G-Line stations. Starting Sunday, the line will require a $3 local fare. RTD is the first transit agency in the U.S. to install positive train control systems on new railroads, which the agency blames for the delays. The technology can boost safety by preventing trains from colliding or moving too fast. “It will enhance the safety of our system,” Genova said. While many have criticized the agency’s troubles with the technology, RTD has not installed it on light rail lines. If it had, the system might have prevented a light rail operator from going too fast on a curve in January, which caused a derailment that severely injured a passenger. The G-Line passes through several residential communities, and its delayed launch required testing along the line to continue longer than expected. The testing involved human flaggers and loud horn blows at road crossings. When the line opens, automated crossing arms will take the place of flaggers and most of the horns will stop as quiet zones take effect. G-Line service will operate from 4 a.m. to 12:30 a.m., with 15-minute frequency from 6 a.m. to 6:30 p.m. Just 9,000 passengers are expected to ride the $1.03 billion line its first year, with ridership projected to grow to 12,900 daily trips in 2035. The G-Line is a part of FasTracks, the measure voters approved in 2004 to expand the region’s rail network. Denver Transit Partners, a private company, will operate the line. That’s not quite correct. The automatic crossing arms were always functioning, even with the flaggers standing in front of the lowered arms. The sentence above makes it sound like the flaggers were the only thing preventing cars from hitting trains, and that the crossing arms will not be put into use until the line opens. Nothing could be further from the truth. That said, I cannot wait until this line opens, I am jumping for joy at the thought of the G-Line becoming a reality, YAY!!!! Too bad they never got it working as expected. The flaggers and horns came in to use because the new system did not meet FRA standards (desires?). The G-Line was always only ever tested with horns blaring and flaggers in place. The first “real” tests of PTC start after the system opens to the public when, as the article says, the G-line will operate (for the first time) without horns and flaggers. Could someone ride the G line from the ward station (B fare zone) to union station (A zone), then take the E line south to Southmoor (B zone) and use a local fare ticket? Interesting. I wonder if RTD will re-evaluate fare zones as they expand considering that someone who rides E/F/R line from broadway to belleview would be on a regional fare ticket and be required to pay twice as much for a much shorter trip on one line compared to two. It is possible. In the past, the dividing line between Local and Regional made it such that Garrison Station was the last Local, and Oak Station was the first Regional along the W-line. We used the Garrison Station ($2) instead of Oak ($4) to go to Denver. Nowadays a Local fare ($3) will get you all the way to Red Rocks, well past Garrison or Oak. So, yeah, it is possible RTD will make changes like the one you suggest (or at least re-evaluate). On the “old” fare structure which was introduced to cope with addition of the T-REX lines, rides from east of and including Sheridan to west of Garrison were charged for riding in three zones — the Express fare. That fare structure was designed to replicate as best as possible the previous comparable bus fares. Anything is possible in the future. However, the basic principle on the “old” system of Local = AB, Express = C, Regional = D and the “new” system of Local = AB and Regional = C is that costs are mostly driven by the MLP (Maximum Load Point) on each route. In the Denver metro area it’s likely that a traveler only goes through one MLP on each ride and so extended travel “outbound” is a freebie. DIA is an exception, which is part of why it is priced differently. There are a number of other subtleties to the fare system as it has evolved over the years, many of which are not understood by decision makers, the media, advocacy groups, etc. That isn’t peculiar to RTD or our times. It goes back to horse-drawn days.